This guy is probably not an alien. If you’ve been following the science news, you’re probably aware of the new study claiming octopuses come from outer space. “Octopuses are from space, scientists say” was one of the catchy headlines published in Australia, while The Express wrote that “Octopuses came to Earth from space as frozen eggs millions of years ago”. These aren’t two cherry-picked instances, the internet was abuzz with variations on the same theme. Unfortunately, however, this is almost certainly not the case. Let’s see what really happened. The new study, penned by over 30 researchers, essentially rehashes the theory of panspermia — the idea that life on Earth emerged in outer space, hitching a ride on meteorites or other objects that crashed into Earth at one point, something often referred to as the Hoyle-Wickramasinghe (H-W) thesis of cosmic biology. The research starts from the Cambrian Explosion an event approximately 541 million years ago, during an age called the Cambrian period. The Cambrian Explosion was an age of extreme diversification of life, during which most major animal phyla started to emerge. The study’s authors question whether that happened naturally, with just the elements existing on Earth. “One particular focus are the recent studies which date the emergence of the complex retroviruses of vertebrate lines at or just before the Cambrian Explosion of ∼500 Ma. Such viruses are known to be plausibly associated with major evolutionary genomic processes. We believe this coincidence is not fortuitous but is consistent with a key prediction of H-W theory whereby major extinction-diversification evolutionary boundaries coincide with virus-bearing cometary-bolide bombardment events,” the study reads. 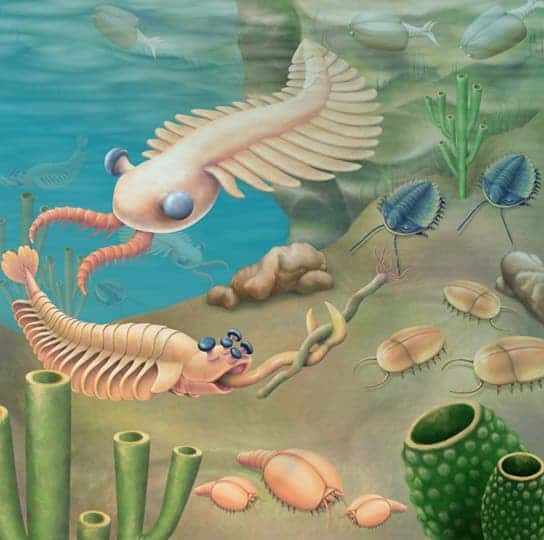 Cartoonish depiction of life in the Cambrian. Alien-like? Sure! Alien? Probably not. Image credits: Rice University. In other words, what they’re saying is that life didn’t just emerge on its own, it was “seeded” from life-bearing comets that pummeled our planet at various times throughout history. These comets could have brought a myriad of novel life-forms from other planets, including viruses. This is one of the main assumptions of the H-W thesis — that small bodies such as asteroids and comets can protect the “seeds of life”, including DNA and RNA. So far, so good; this is a plausible idea, that has been investigated since the 1970s and continues to be analyzed by various groups. There’s not much evidence to say that it did happen, but with what we know so far, it might have happened. Then, the authors make a big leap: if you’re not convinced by the panspermia theory, you need not look farther than the octopus. Octopuses have very complex nervous systems and big, specialized eyes — two unprecedented features. “A second focus is the remarkable evolution of intelligent complexity (Cephalopods) culminating in the emergence of the Octopus,” the study continues. This is where it starts to get thorny. Cephalopods, the group in which octopuses belong, did emerge in the Cambrian — the fossil records clearly suggest so. But the early cephalopods were Nautiloids, a very diverse group of creatures which exist to this day. But Nautiloids look completely different to octopuses, and they don’t share many of their impressive features. In fact, octopuses didn’t emerge until the Devonian, 323 million years ago. This means that there’s a window of over 200 million years from the Cambrian explosion to when the first true octopuses emerged, which is plenty of time to selectively develop specialized features (there are studies which say octopuses developed a bit earlier, but not significantly in this context). 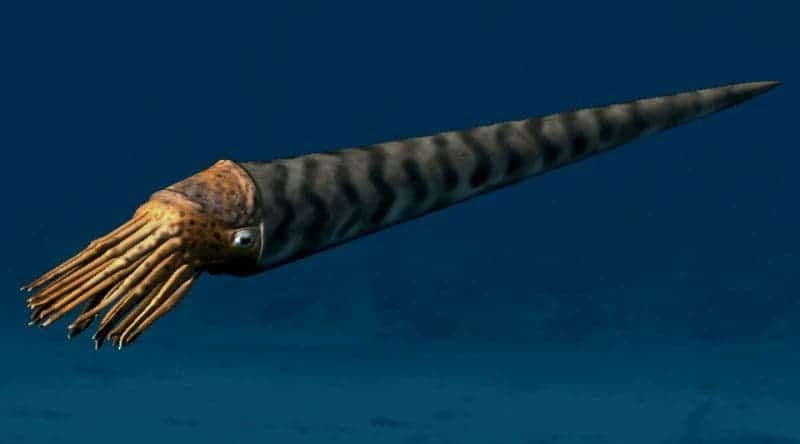 Artistic depiction of Orthoceras — an early nautiloid. Image credits: Nobu Tamura. Furthermore, when the octopus genome was mapped in 2015, it was shown that the nervous system genes split from the squid’s only around 135 million years ago — again, long after the Cambrian explosion. In all practicality, the evolution of the octopus was never really regarded as a mystery requiring additional explanation. This is an ancient group with some remarkable features, but these features didn’t appear in the earliest creatures, developing gradually over the course of hundreds of millions of years. Instead, what the new study suggests is that fertilized octopus eggs hitcher a ride aboard an icy comet and crashed into the sea at the onset of the Cambrian explosion. Alternatively, researchers write, an extraterrestrial virus infected a population of early squid, causing them to evolve in this unusual way. 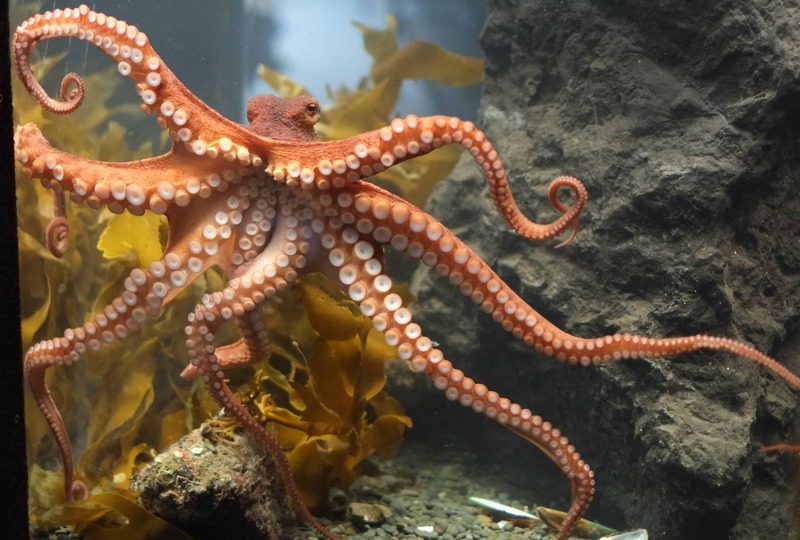 The genes responsible for the octopus evolution, they say, don’t appear to have come from their ancestors. “The transformative genes leading from the consensus ancestral nautilus to the common cuttlefish to squid to the common octopus are not easily to be found in any pre-existing life form,” the study, published in Progress in Biophysics and Molecular Biology, claims. Again, this is technically possible. It might have happened. But that doesn’t mean it did. Occam’s razor suggests that the simpler explanation is usually the better, and this is probably the case here — there’s no reason to go and speculate about extraterrestrial origins. It’s noteworthy that in his review of the paper, medical researcher Keith Baverstock from the University of Eastern Finland, concedes that there’s a lot of evidence that plausibly aligns with the H-W thesis, such as the curious timeline of the appearance of viruses — and yet, herein lies the problem: plausibility does not mean probability. Basically, just because something can happen doesn’t mean it did. The new paper goes to great lengths to prove that it could happen, and to open some interesting discussions. Make no mistake, this is not an amateurish study published in a predatory journal. However, the scope of the paper is oversold, and as Ken Stedman, a virologist and professor of biology at Portland State University, told Live Science, the authors didn’t carefully review existing literature, and they make extremely speculative claims. Of course, mainstream media was all over this. The idea that life on Earth came from outer space is terribly appealing — particularly when we’re talking bizarre creatures like octopuses, and everyone gasped at the idea of an alien octopus. Unfortunately, that’s probably not the case. Octopuses are fascinating creatures, and I hope we can cherish them even if they’re not aliens.